Survive Spring Break with Essentials from SwimWays, Aerobie & COOP! Thank you to SwimWays, Aerobie & COOP for providing me with product in exchange for my honest review. All thoughts are my own. Spring Break has officially begun, and after a long and downright cold winter, I have never been more ready to enjoy a bit of sunshine! The weather is warming up just in time for Easter, and it couldn't have come at a better time. Area schools are on spring break, and we're spending the few days before Easter at home, and then headed to the beach for a mini family vacation. Whether you're traveling or planning to stay close to home over Spring Break, surviving a week with the kids can be a challenge if you plan to just fly by the seat of your pants and wing it. 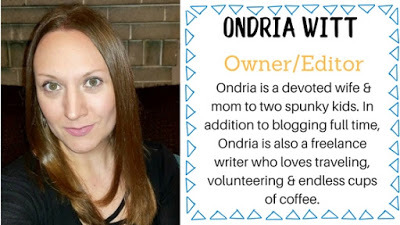 My hubby is working off and on during the kids' break from school, so it's just me and them- and I'm already planning fun activities for us to do at home so we all stay sane and still love each other at the end of the week (little joke there). We're Making a Splash with Cool Pool Toys from SwimWays! My first and oldest water baby loves to play in the water! 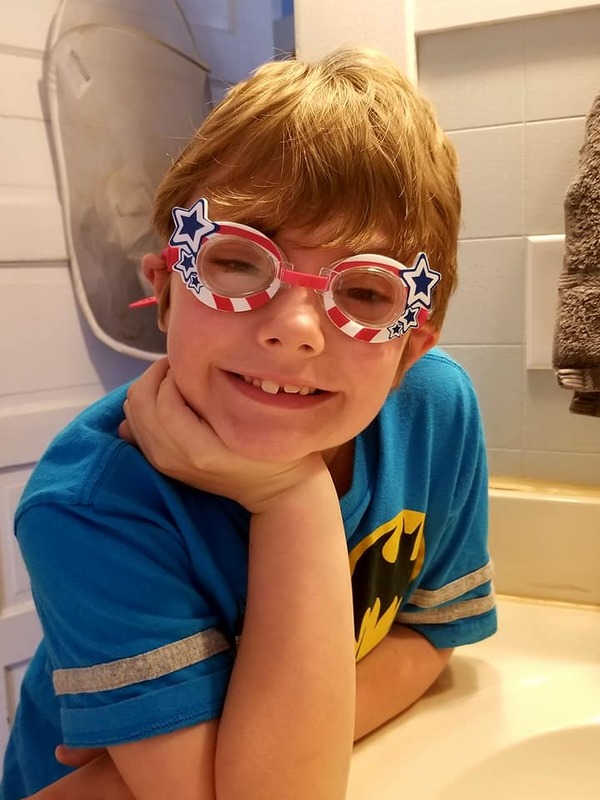 Like his cool Funny Face Swim Goggles (SwimWays, $7.99)? I have two water babies who love to splash and play. Their dream is to spend all summer in a pool, at the splash pad, or running through a sprinkler in the backyard. My dream is to be able to watch them safely play, without getting wet. Since it's going to be nearly 80 degrees over spring break, we're going to play with the water table in the yard, and can't wait! We even enjoy water play indoors on cold days. Filling up the bathroom or kitchen sink with warm water and adding some fun water play toys is always a fun way to play and pass the time. We've had extra splashy fun with cool new products from SwimWays already this spring! Their Funny Face Swim Goggles are really cool, and with adjustable straps, they're super easy and comfortable for kids to wear. These are perfect for kiddos ages 3+ and are available in three styles. B had a blast with the SquiDivers. He loves swimming at the YMCA, and when he goes for a swim with his grandma, they often practice diving with diving toys. 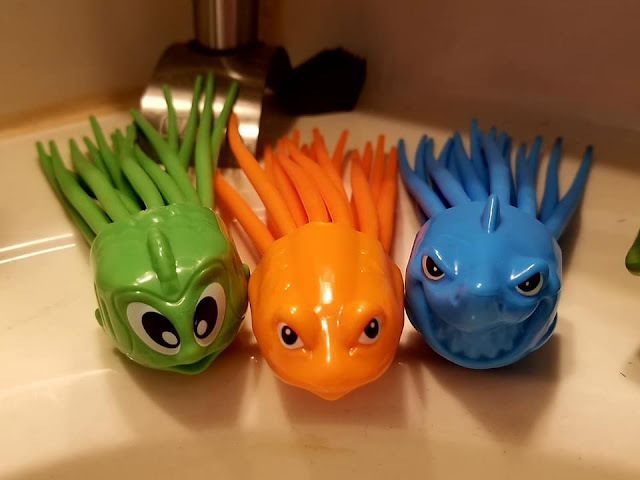 We're excited to add these little guys to our collection of diving toys.They land nose down at the bottom of the pool and their wiggly squiggly ends float in the water, making it easy for kids to find them. They come in sets of three for $9.99. Super swimmers work on their 'save the world' skills with Avengers Dive Characters from SwimWays. 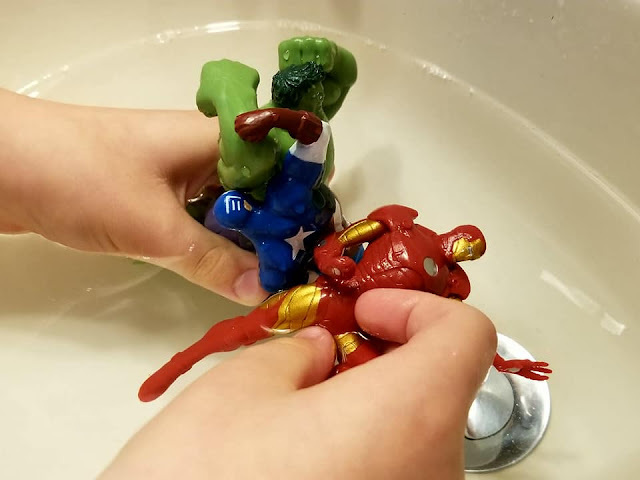 My little guy is a huge MARVEL Avengers fan, so when he opened up a pack of AVENGERS dive toys, he jumped up and down with excitement. Captain America, Hulk, and Iron Man are among the cool dive toys in this set of three pool toys. Avengers Dive Characters are soft and flexible full-figural dive toys that look like kid's favorite characters! Kids can not only have fun diving to retrieve the characters but can also play with them outside the pool. Each set includes three different characters, available in the following assortments: Captain America, Black Panther and Hulk Buster or Iron Man, Black Widow and Hulk. Get Out and Play with Toys from Aerobie & COOP! 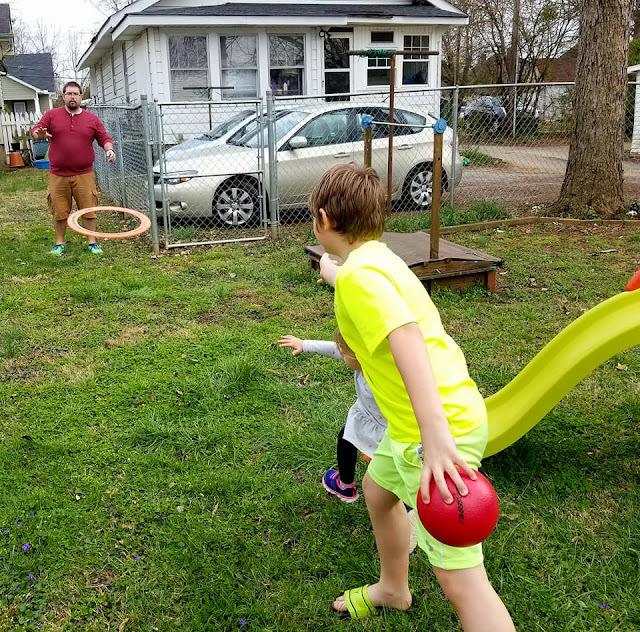 We've been having a ball with a fun new Dodgeball game from COOP! 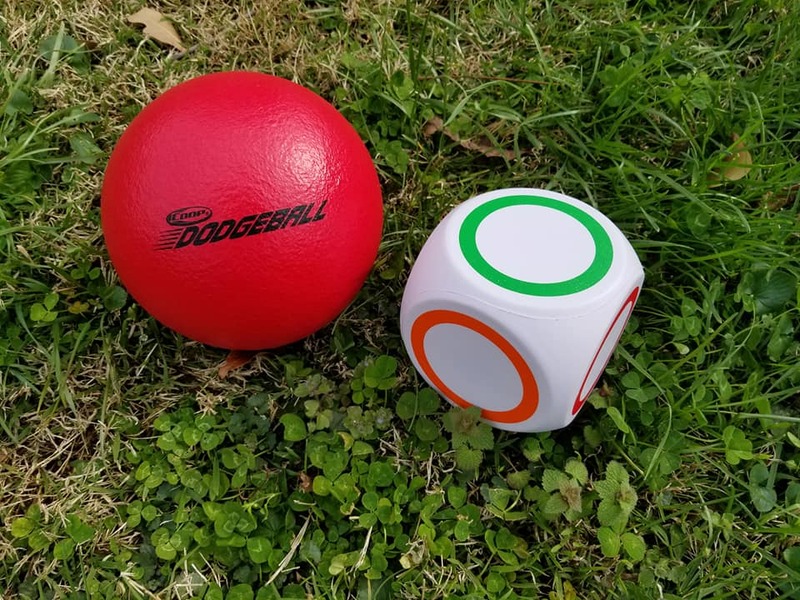 Scatter Dodgeball by COOP is a fun new twist on a classic game. I used to hate playing dodgeball in gym class. The playground balls were way too hard and hurt when they hit bodies. COOP's Scatter Dodgeball is a much safer and friendlier version of the old playground game. It includes a soft dodgeball, soft die, and colored armbands for each player. At the beginning of each round, players form a circle around the dodgeball while one player rolls the dice. Any player who is wearing a wristband that matches the color face-up on the dice is the thrower and may pick up the dodgeball while the other players scatter. As the other players scatter, the thrower attempts to hit them with the dodgeball. Players that get hit must surrender a wristband to the thrower. If the targeted player catches the ball, the thrower must surrender a wristband. The first person to collect all the wristbands wins! Even Baby S loves this fun game! It's perfect for the whole family! The Amazing Aerobie Pro Ring is a Family Favorite! Everyone wants in on some Aerobie Pro Ring action! My husband was so tickled when he saw the Aerobie Pro Ring on our dining room table. 'No way!' he exclaimed! He had one of those bad boys when he was younger and absolutely loved it. Now he's thrilled to be able to play with it with our son. With just a flick of the wrist, the Aerobie Pro Ring flies through the air at lightning speed! It's easy to throw and flies far! We have to be careful not to throw it into the neighbor's yard! We're All Set for an Amazing Spring Break! 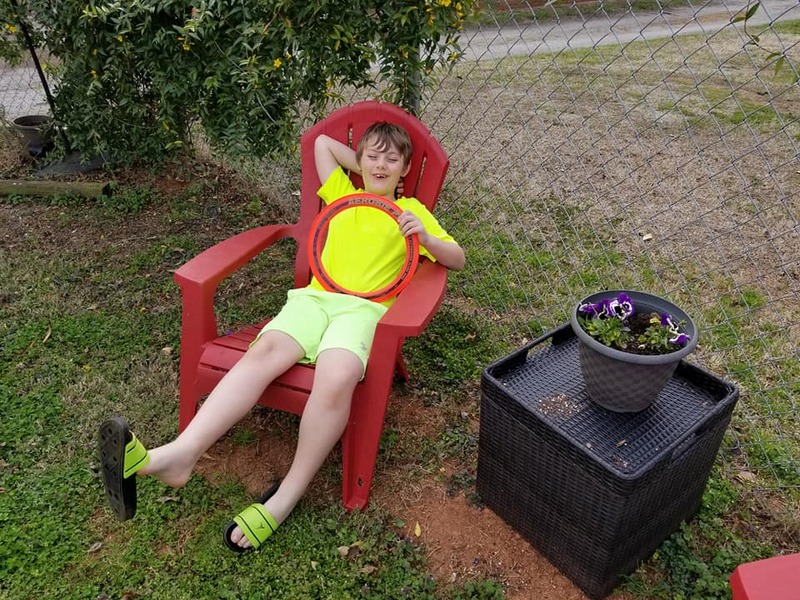 We're planning to keep on enjoying these cool pool and outdoor toys and games over our spring break. We're even taking them along with us on our beach trip. 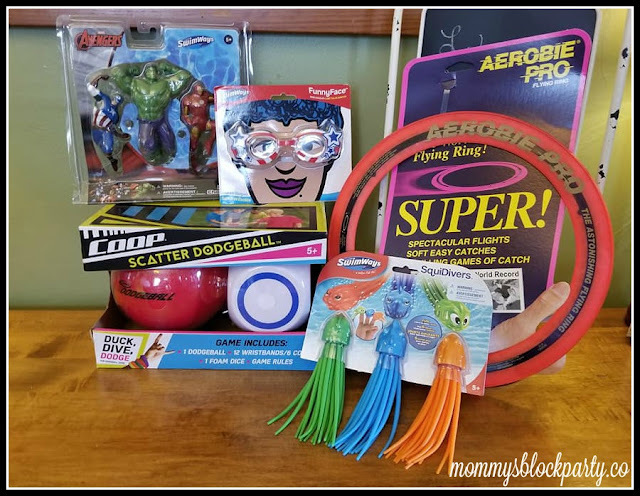 The diving toys and goggles are perfect for indoor pools, and the outdoor games are going to be lots of fun to play with on the beach! We can't wait! I noted above where you can find these cool products, but you can also purchase them through the MBP Amazon Shop! It's not too late to grab these and fill those Easter baskets with these fun gifts! Connect with SwimWays on Facebook and Twitter. Connect with COOP on Facebook and Twitter. 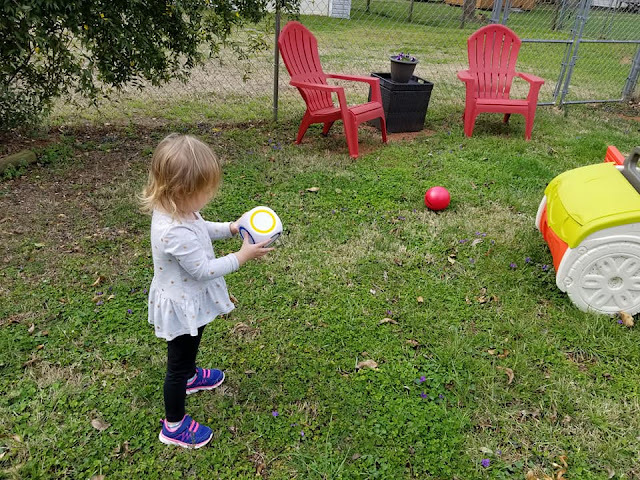 Connect with Aerobie on Facebook. Special thanks to SwimWays, COOP & Aerobie for allowing me to share about their awesome pool toys and outdoor games this Spring! Look for them in our 2018 Easter Gift Guide! Which of these cool toys/games would your kids love to play with this spring? My son would love the SquiDivers - I've never heard of these before reading this post. Thanks for introducing me to these great toys!